Preheat the oven to 400 degrees . In a shallow dish, combine the cheese with the paprika and parsley and season with salt and pepper. Drizzle the fish with olive oil and dredge in the cheese mixture. 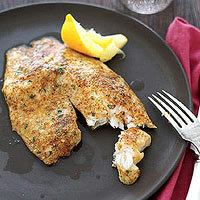 Place on a foil-lined baking sheet and bake until the fish is opaque in the thickest part, 10 to 12 minutes. Serve the fish with the lemon wedges.